Axis offers specialized yoga workshops, retreats and trainings, many of which are offered on a donation basis. These events will give you a flavor of what Axis is all about and provide an enriching educational experience. Yoga Alliance continuing education credits are available for many events and all are welcome to attend. 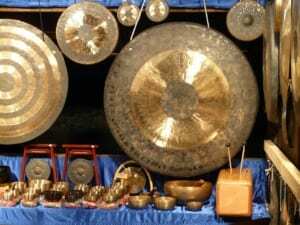 Axis Yoga and Denver’s beloved gong-master, Gary Fishman, have teamed up once again to offer another Soul nourishing Gong Bath! Experience a vibrational cleanse as you lye on your back and let the sound of gongs, singing bowls, and didgeridoos wash over you. Anoint your body with power crystals to magnify the affect. Provided. Bring something to lye down on. Bonus! Bonus! Free pre Gong Bath yoga class for the first 40 who register. Space is limited. Our students are about to graduate! After nearly four months of preparation, they are now ready to share the culmination of their journey with you. Every presentation will be an entirely unique distillation of each student’s love and study of yoga. They’ve rigorously applied themselves to the study of classic yogic texts, breathing methods, meditation, yogic diet & lifestyle, and of course the postures – and are now ready to share their understanding with you! Your presence and support is most welcome! Monique B., Lisa B., Jen R.
Cory W., Stef L., Amber E.
Tina P., Jen J., Ariel T.
Gene O., Morgan G., Izzy L.
Elena D., Asia I., Emily M.
Unite with fellow women as we co-create a sacred container to explore sound, breath, movement and yoga. Held in an open and supportive space, let us explore our unique feminine relationship to yoga and discover how we can nourish ourselves individually and collectively through a deeper connection with the body and all its senses.